Four volumes (25 cm), I (1971): (12) 141 (3) pp., 125 black & white plates (pls.1-125). II (1973): (10) 114 (2) pp., 107 black & white plates (pls.1-107). III (1980): (10), 119 (1) pp., 112 black & white plates (pls.1-112). IV (1986): (10) 98 (2) pp., 77 black & white plates (pls.1-77). Uniform publisher’s brown cloth, pictorial dust jacket (except vol. II, in publisher’s printed wrapper, with pictorial dust jacket). 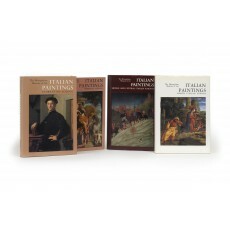 - Catalogues of some 400 Italian paintings in the Metropolitan Museum. 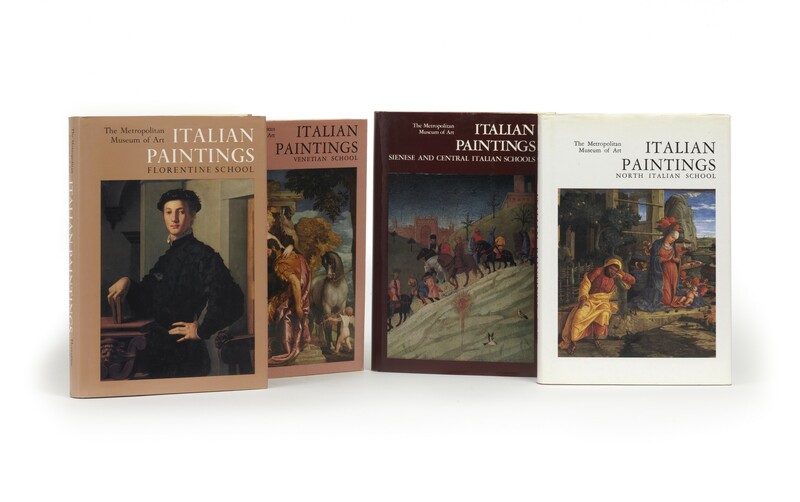 Each catalogue is arranged alphabetically by artist; a brief biography of each artist is given, and every painting is illustrated. ¶ Fine set with minimal traces of use and no marks of ownership. (25 cm), (12) 141 (3) pp., 125 black & white plates (pls.1-125). Publisher’s cloth, pictorial dust jacket. ¶ Excellent copy. (25 cm), (10) 114 (2) pp., 107 black & white plates (pls.1-107). Publisher’s printed wrappers, pictorial dust jacket. - Catalogue of works by 48 artists and workshops. ¶ Excellent copy. (25 cm), (10), 119 (1) pp., 112 numbered black & white plates. Publisher’s cloth, pictorial dust jacket. - Catalogue of works by about fifty artists and workshops, in the same format as the 1971 and 1973 catalogues on the Florentine and Venetian schools. ¶ Excellent copy. (25 cm), (10) 98 (2) pp., 77 black & white plates (pls.1-77). Publisher’s cloth, dust jacket. - Discusses the work of 48 artists of the 14th-late 16th centuries. Full catalogue entries with commentaries and illustrations of all works. ¶ Excellent copy.